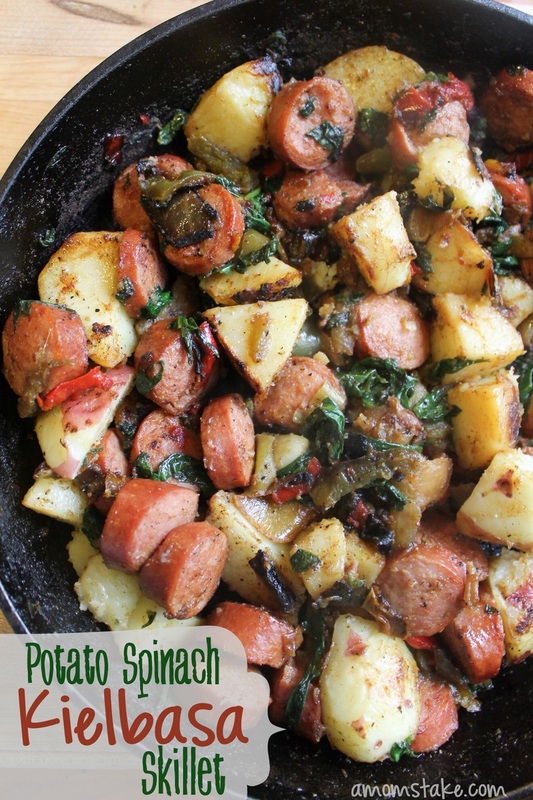 This Potato Spinach Kielbasa Skillet is one of my go to meals since everyone, including the kids love this dish. It is simple to prepare, and ready in less than 30 minutes from start to finish, not to mention I get to sneak in some good greens for my family. I stock up on frozen peppers and onions when they are on sale because they really save me a lot of time and when you are cooking them down anyway they taste just as good as fresh. Kielbasa is another great stock up item when it goes BOGO or another good sale, as it lasts a good while in the refrigerator and freezes very well. 1 bag frozen peppers and onions or 1 small onion, 1-2 bell peppers. Peel and dice your potatoes. Dice kielbasa into bite sized pieces as well. 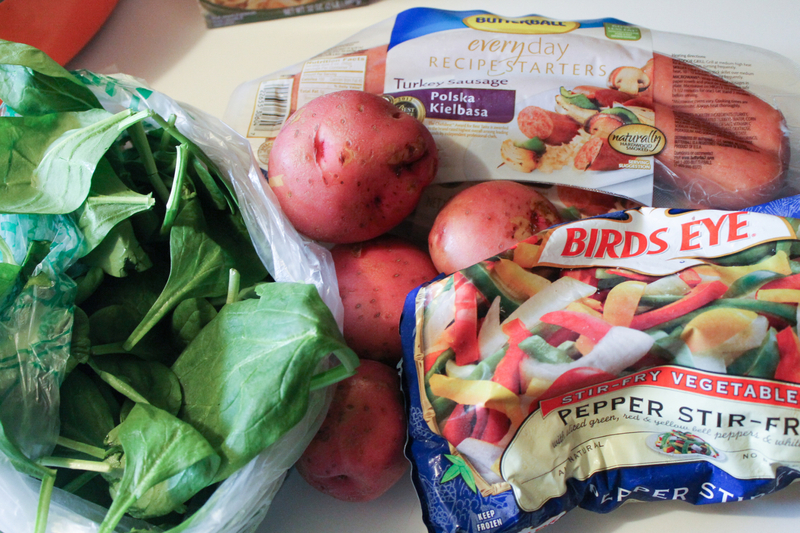 Now, wash, drain, and tear the spinach into smaller pieces. Place potatoes in heat safe dish with 2-3 Tbsp. water and microwave for 8 to 10 minutes until fork tender. Meanwhile, start sauteing your onions and peppers in a large well-seasoned skillet or pan in olive oil until onions begin to soften. Add your cooked potatoes and diced kielbasa. Cook another 5-7 minutes until browned and heated through. Season with garlic salt, and pepper to taste. Stir in spinach and cook, stirring frequently until wilted and cooked through, about 5 minutes. That’s it! Your meal is ready to serve. You can also add in your favorite fresh vegetables like squash, zucchini, and corn to the skillet at this step or serve them on the side. Click below to print/save this recipe or pin this page to bookmark! Hearty and filling meal that cooks in under 30 minutes! Dice kielbasa into bite sized pieces. Wash, drain, and tear spinach into smaller pieces. Place potatoes in heat safe dish with 2-3 Tbsp. water- microwave for 8 to 10 minutes until fork tender. 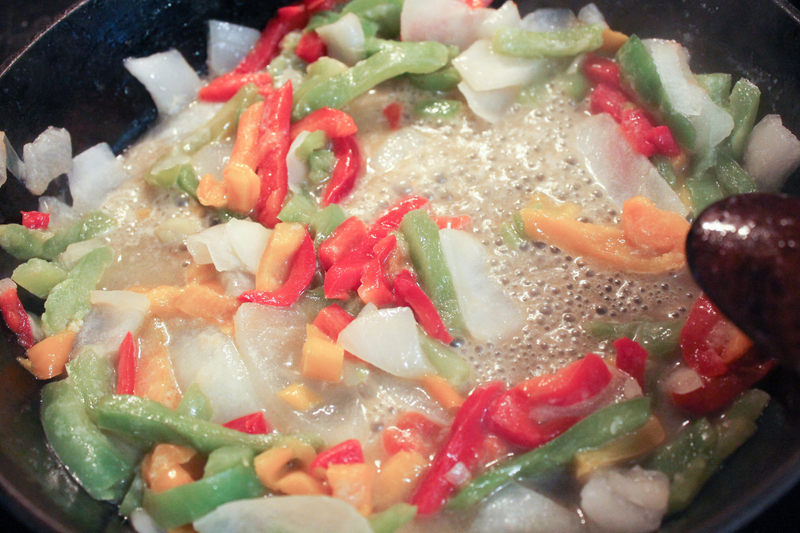 In a large well-seasoned skillet or pan saute onions and peppers in olive oil until onions begin to soften. Add potatoes and kielbasa, cook another 5-7 minutes until browned and heated through. Season with garlic salt, and pepper to taste. 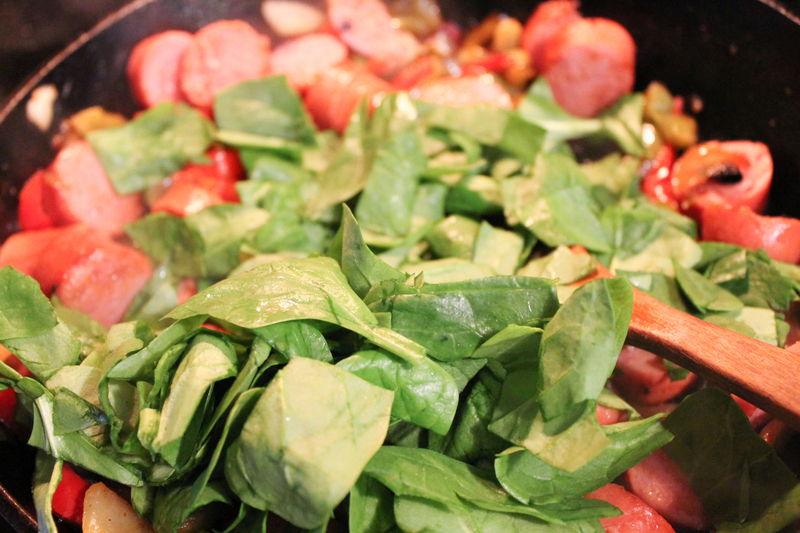 Do you have a favorite Kielbasa Skillet recipe? Tried this last night. Both my boyfriend and I loved it! 🙂 Thanks for sharing such a great recipe! My family loves kielbasa sausage. This is a great dish for summer since we grow peppers in the garden, now I have a new dish to make with them. this looks so tasty and a homestyle dinner for the family. would love to make this for the family one day.